I once asked my colleagues at the volunteer organisation I work with what sort of food are distinctly New Zealand; I wanted to check out the gastronomic possibilities here in Aotearoa. The Pavlova came into the picture. Made primarily of egg whites, it looks very much like a meringue cake. I have seen these sold in food shops but did not realize that this is just the base; it needs toppings to make it more aesthetically appetizing and delectable. We haven't bought any Pavlova though because it's too big for us and there wasn't really any occasion for us to buy one. 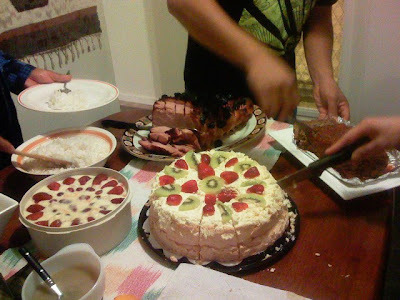 We finally had one when we got invited for Noche Buena at our friend Glen and Cory's home. The strawberry and kiwi topping with cream made the pavlova very colorful and dressed up for the holidays! This sweet, white concoction reminded me very much of brazo de mercedes. 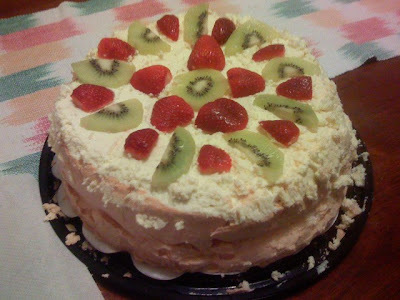 When I first heard of the Pavlova actually, I thought it was a rather strange name for a kiwi dessert. In fact, it sounded more Russian than Kiwi! Writing this post prompted me to read about its origins. I learned that this sweet delight that has been part of Kiwi life since the early 1920s was inspired by the Russian ballerina Anna Pavlova when she visited New Zealand at around that time. Challenged to prepare something special, the chef in the hotel where Ms. Pavlova stayed came up with this creation and it was declared "light as Pavlova."